If you are looking for an easy and healthy snack or appetizer, you need to try these Kiwi Cheese Crackers! Cheese and crackers is one of my go-to snacks for anytime of year. I also love fruit. 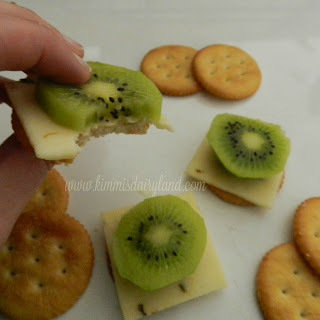 I had a few kiwis leftover from making my awesome Tropical Fruit Salad, so I decided to slice it up and add it to my cheese crackers. Oh my gosh. Best decision. It's delicious. Our cows also love fruit and fruits and vegetables are awesome snacks for them in the summer when they are in season. Our cow Hannah always tends to be a subject of a lot my photos of our beef cows. I guess she’s always in the right place at the right time. She also lets me know that she doesn’t like photos. It’s educational, so I just tell her she’s famous. This is making me hungry. Maybe I should go make myself some of these Kiwi Cheese Crackers. New Diet Taps into Pioneering Plan to Help Dieters Lose 23 Pounds in Only 21 Days!